Ship Shape Elementary: Classroom Decor Giveaway! Thank you all for your participation! 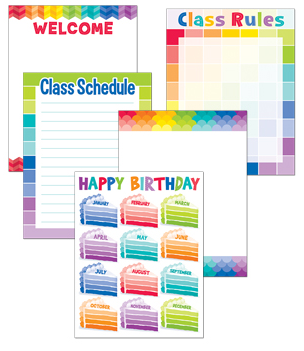 Click here to find a local dealer of Creative Teaching Press items near you! Thank you! For the last few weeks I've been walking into my school each morning with bated breath. The promise of summer has been lingering in our hallways and now it is just around the corner! I've been reflecting on the wonderful experiences, challenges, students and parents, and goal-setting opportunities that I have encountered this year and I cannot help but feel grateful. I've never been one for a classroom theme...maybe I have commitment issues. If you were to ask me what my theme is I might say, "....uh...happy bright colors and a variety of patterns...?" Which could include a whole bunch so maybe that doesn't count as a theme. 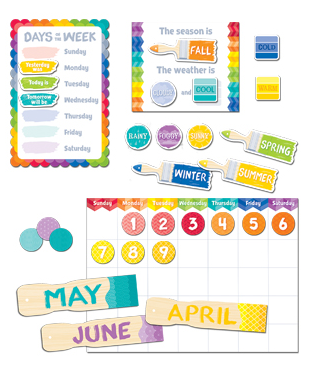 Creative Teaching Press has alway been my go to for classroom decor and I am excited today to share a glimpse into a few of their fun new items. This year they are celebrating 50 years and they've really outdone themselves with these cute new classroom decor items. Oh, and guess what? They want to give you a chance at a $50 credit to Creative Teaching Press...so keep reading! Creative Teaching Press has a ton of different decor collections and I've always been a fan of the Dots on Turquoise collection so I'm excited to try a new take on it with some of the new collections. I've played around with some layering of borders in the past, but I'm loving these latest ideas. Here are some other items I've got my eye on...and you might as well have your eye on them as well since you have the chance to win $50 worth of Creative Teaching Press swag! :) I'm rapidly falling in love with the new Painted Palette collection. Look at these! Cute stuff, yeah? Okay, want a chance to win $50 worth of whatever you want from Creative Teaching Press? Use the Rafflecopter below to enter the giveaway. It's open until June 7th at 8pm! Good luck! For more glimpses into new products (and another chance to win!) from Creative Teaching Press, hop over to Carmen's blog, Exploring Elementary. The new chalkboard sets from CTP are so great! I would love to have a bunch of the new borders, for sure! Thank you for the giveaway. I like the posters! I love the inspire posters pack!!! I love the entire chalkboard collection! I would love to have the chalkboard calendar! I would love to have the painted pallet borders- love! I love the Inspired U Pack #1!!! 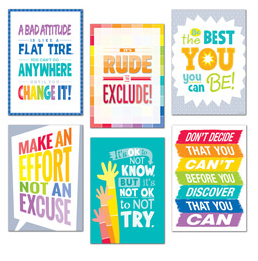 I love the Inspire U poster collection! I love the borders and the Inspire U pack! I like the painted palette ombre in turquoise. I love so many of the borders. Thanks so much! I would love the chalkboard posters! This is so fun! I like the ombré turquoise border. I love the borders! Any of them! Loving the new chalkboard and painted palate themes!! Love how you mixed Dots on Turquoise with the new products So cute! I really love the chalkboard borders - the light bulbs and different designs are so cute!! I would love the painted palette! Thanks for the chance! I would buy some boarders. I love the chalkboard collection. I love the turquoise!! I need a new calendar set, too. I love the scalloped trim and considering the calendar set. I am starting my first year as a Kindergarten teacher so I need alot of things. Question about your TPT products. I saw your chalk it up items. How do you print those? It seems like it would take alot of black ink right?? I love their borders and quotes posters!! I love the HexaFun collection!